Anyone living or parenting with food allergies knows how difficult some holidays can be. With our son’s allergies to milk, soy, egg, nuts (both peanut and tree nut), garlic, green pea, coconut and hemp finding candies that he CAN have is a little tough. I try to make special chocolates for the holidays. My Mom and I get the chocolate molds at the craft store. I have quite the collection. 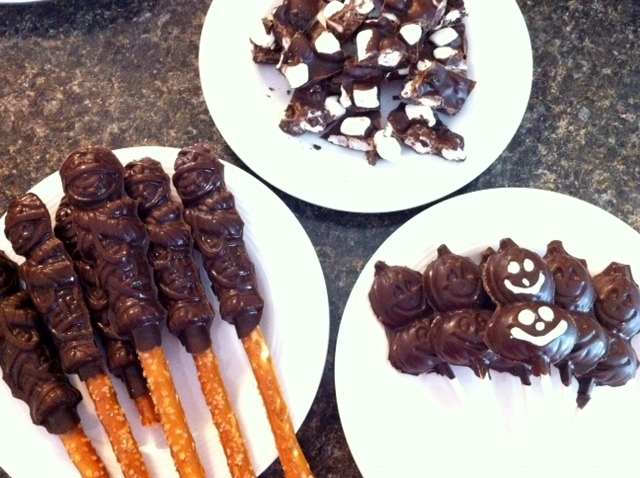 Today I made Chocolate Mummy Pretzels and Chocolate Pumpkin Pops. They’re super easy to make and it only dirties one bowl so it’s super easy clean-up. Just melt the chocolate in a double boiler and spoon into the molds. I also like adding different fillings like raisins, rice krispies, sunflower seeds, pumpkin seeds, dried fruit, marshmallows, etc. Molds aren’t necessary either. Sometime I just pour chocolate on a covered sheet pan and drop some fillings in and let it set. Once it cools I just brake it up into individual pieces. « RECIPE: Apple Pumpkin Muffins! where did you buy the chocolate? Enjoy Life chocolate can be purchased at many grocery stores across the US. Try the organic/specialty department of your local grocery store. I am so excited to read your blog and recipes! I am not raising a child with these allergies, I am a mom/grandmother who has been dealing with this life altering set of allergies for several years. I am looking forward to finding new ideas and perhaps sharing some of my own. Keep researching, and writing, and just being a great mom, Elizabeth! !